If you have been reading the popular photography press over the last year you might have come across a number of articles about Holga cameras. If you are not already familiar with these little wonders they cost around £20, are made in China from plastic, have a dreadful lens that produces wonderfully artistic images, leak light and take medium format role film. The camera has something of a cult following and fantastic examples of Holga photography can be found on www.toycamera.com. Now if you don’t want to shell out £20 or can’t be bothered going back to film, here is how to simulate a Holga effect in Photoshop. 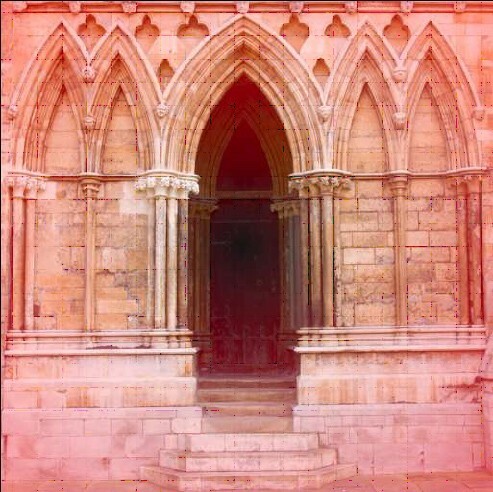 What Makes a Holga Image Distinctive? The lens is only sharp and focussed at the centre of the image. Around the edges it becomes very blurred, almost like a pinhole camera. The images are usually square (6cm x 6cm negatives) although the Holga does ship with a plastic insert that converts it to a rectangular format (6cm x 4.5cm). The lens tends to vignette very badly around the corners so that the centre of the image is bright but the edges tend to be dark. The Holga only has one shutter speed so it tends to be used with ISO400 print film. This gives a fantastic grain effect which if you have been using digital for more than a year you have probably forgotten about. The camera leaks light so that you tend to get the edges of your film exposed which can create random but very attractive effects; then again you might hate this. The rest of the tutorial will explain how to digitally recreate the above effects in Photoshop with the exception of the light leaks (I have to keep some secrets to myself). It’s also worth pointing out that the tutorial assumes a good basic knowledge of Photoshop with the use of layers and quick mask. The starting point for this example is a regular image shot with a Canon 300D at 2048x3072 pixels. The image is of a doorway in Lincoln Cathedral which could make an interesting subject. The first illustration shown below (figure 1) shows the image when it has been cropped to a square of 2048x2048 pixels. Select your image and crop it to a square format. The next step is to add the film grain effect to the image. To do this, duplicate the image to a new layer by pressing Ctrl-J on the keyboard. Alternatively select “Layer|New|Layer via copy” from the Photoshop menu. 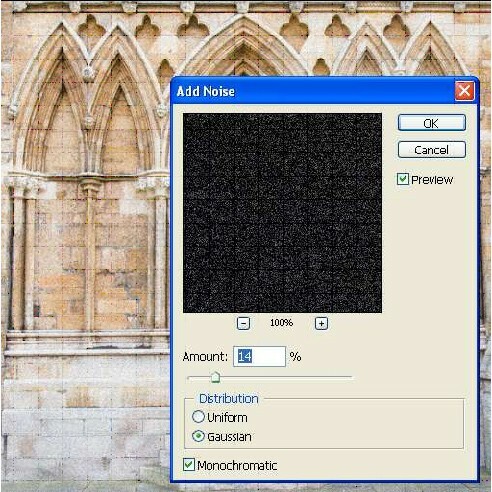 With your new layer select “Filter|Noise|Add Noise” from the Photoshop menu. The “Add Noise” filter dialog will then be displayed as shown in figure 2 below. You can now select a suitable level of noise to add. How much you add will depend on the look you are trying to create and the resolution of the image you are working on. Generally the higher the resolution the less the noise can be seen. The other settings I use on this dialog are “Gaussian” with the “Monochrome” option ticked, or the noise won’t resemble film grain. You should now have two layers in your image, the default “Background” with a film grain layer on top of that. Create another copy of the Background layer and then select the “Quick Mask Mode” from the tools pallet. We are now going to create a radial gradient so that we can delete the centre of the image and leave the edges. Using the gradient tool with a radial gradient selected, draw from the centre of your image to just over the edge. In my example I have gone over the edge by about half the distance to the centre of the image. This will create the mask as shown in figure 3 below. Having created your quick mask you can return to the standard mode to see the selection you have made. This should cover the centre of the image and is the area that will remain in sharp focus. If you didn’t get it quite right return to the quick mask and create a new selection. You can now press the delete key on your keyboard to erase the centre of the image. If you haven’t already done so this is a good time to rename your layer “Blur”. With the new Blur layer selected chose the radial blur filter from the menu. This is found under “Filters|Blur|Radial Blur” causing the dialog shown in figure 4 to appear. In this example I have used the Zoom setting with an amount of 10 and set the quality set to Best. It’s well worth experimenting with these settings for your images if this is the first time you have used the filter. Once complete your image should look something like that shown in figure 5 below. Now it’s time to add the vignette to the corners of the image. Start by creating a new empty layer by selecting “Layer|New|Layer…” from the menu. Call this layer Vignette. On the new layer we are going to draw a radial gradient using the gradient tool. This should be of a similar size to the one created above when using the Quick mask mode however this time we are not creating a mask. The gradient should be transparent at the centre changing to black at the edge. This is probably not the gradient already in use so you might need to select a new gradient from the toolbar. Once you have created your gradient the image should look similar to that in figure 6 below. At this point the Vignette effect is a little too strong for my taste so I would set the vignette layers opacity to 80% in the layers window. It’s now time to adjust the luminosity and contrast of the image. Normally I would do this using curves to help preserve the image but remember this is a Holga so we will use the “Brightness/Contrast” adjustment. Create a new adjustment layer using the menu “Layers|New adjustment layer|Brightness/Contrast…”. Set the Brightness slider to -30 and Contrast slider to +20. This gives a nice look to the image but it’s a little too dark so we need to lighten the image. Add a new Curves adjustment layer using the menu “Layers|New adjustment layer|Curves…”. In the curves dialog increase the brightness of the image substantially. Don’t worry if you overdo it as you can always fine tune it later by adjusting the Opacity of the layer. The effect should look something like that shown in figure 7 below. At this point you have a finished colour image. Many Holga enthusiasts however prefer to shoot in black & white so we will now add a saturation layer to achieve this. Add a new Hue/Saturation layer by selecting “Layers|New adjustment layer|Hue/Saturation…” from the menu. Move the Saturation slider down to 0 to remove the colour and you should see an effect similar to that in figure 8 below. As this is quite a complex process you might want to create an action to automate it or alternatively you could buy a Holga and learn to love film again. This tutorial will also help you to create the Holga Effect in Lightroom.